Among those who shared the post expressing Warren Cohen's frustration at myopic concert planning was violinist Johannes Pramsohler. 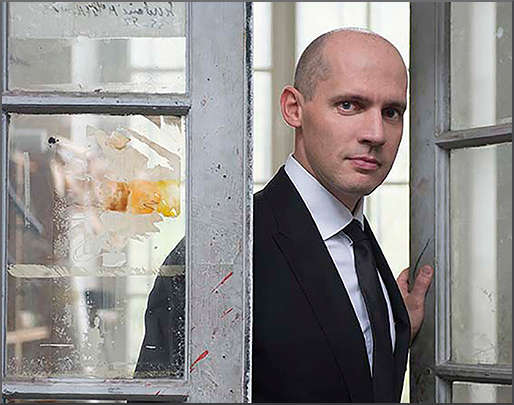 His Facebook share elicited a comment from baritone Stéphane Degout who is seen above. Stéphane is a big hitter in the operatic world and his comment contains an important message for all those who capitulate to the tyranny of programme planners and marketing experts; so I have posted it below in translation*. As Virgil Thomson told us, never underestimate the public's intelligence, baby, and never overestimate its information. Forty minutes of Debussy's songs last year, forty minutes of Poulenc/Apollinaire plus a trio of contemporary works in the same programme this year. Programme planners sometimes tell me that my recitals are too rarified, too intellectual, and that no one will come. But the rooms are full and the audience loves it. The tastes of audiences are often misjudged: the public are not backward children who only like what they know, and who have no appetite for the new or willingness to adapt. Quite the contrary! I was often told my programmes “will not interest anyone” and was asked for programmes mixing opera arias and more popular pieces. But I always refused; because I believe one must first acknowledge the audience's intelligence instead of acceding to the wishes of a programme planner who has a narrow outlook and an inbuilt fear of risk. * Stéphane Degout's comment was in French; I take full responsibility for the loose translation. Photo is via IMG Artists. Any copyrighted material is included for critical analysis only, and will be removed at the request of copyright owner(s). Also on Facebook and Twitter. As a listener I couldn't agree more. While our own local orchestra does a good job overall, I struggle to find more than a couple of concerts each season that are worth the time and (exorbitant) cost to attend. My listening years are finite and I can't bear to spend the remaining ones re-hearing Mendelssohn, Liszt, Mahler (ad nauseam), Tchaikovsky, Schumann, etc. Especially after I've been spoiled by the digital cornucopia of the streaming services.